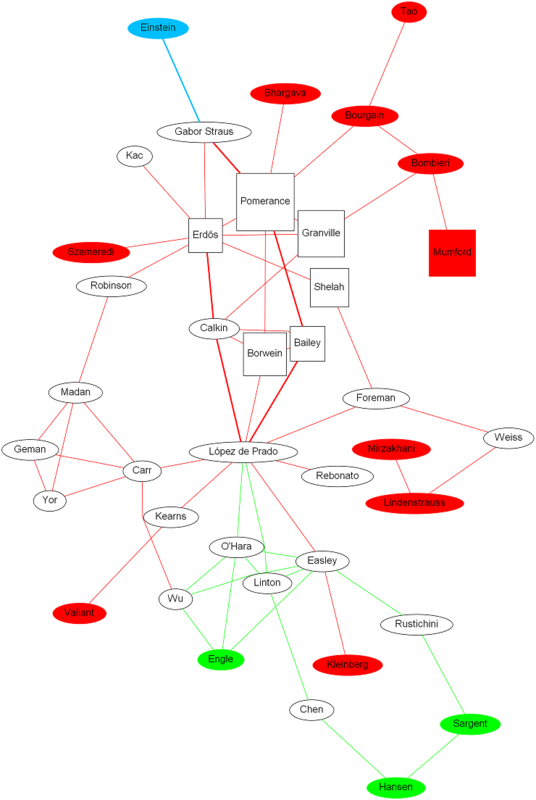 Below is a summarized collaboration network, which makes it easy to visualize three main clusters: Pure Mathematics (centered around Paul Erdős and the Fields-Nevanlinna medallists), Mathematical Finance (centered around the Carr-Geman-Madan-Yor team) and Financial Econometrics (centered around the Nobel Laureates in Economics). RED: Fields Medal, Abel Prize or Nevanlinna Prize. BLUE: Nobel Prize in Physics. GREEN: Nobel Prize in Economics. SQUARED: Wolf Prize or Chauvenet Prize. RED: Mathematical publication. Contrary to common belief, modern mathematical research is a highly collaborative enterprise, where teams of researchers pursue a common interest and build upon each others' innovations. A formalized field lends itself to team-working because concepts can be rigorously defined and debated (see the Polymath project for astonishing examples of massive collaboration). Below is a partial list (in alphabetic order) of the ~30 co-authors with whom I have had the fortune to do research and publish some of our results. Faculty, Financial Mathematics, Courant Institute of Mathematical Sciences, NYU. Co-inventor, U.S. Patent #7630930, "Method and system for portfolio optimization from ordering information". Complex Systems Lead, Lawrence Berkeley National Laboratory. Research Fellow, Department of Computer Science, University of California, Davis. Former Researcher at NASA's Ames Research Center. Winner of the Sidney Fernbach Award (IEEE Computer Society). Winner of the Chauvenet Prize (Mathematical Association of America). Winner of the Hasse Prize (Mathematical Association of America). Winner of the Gordon Bell Prize (Association of Computing Machinery). Winner of the Levi L. Conant Prize (American Mathematical Society). Winner of the Test of Time Award (ACM/IEEE Supercomputing Conference). NERSC's π project (National Energy Research Scientific Computing Center). David's research was featured in The Simpsons! Six books on Experimental Mathematics, one book on supercomputing, and over 200 papers. Erdös #2, Einstein #3 (AMS). Senior Scientist, Department of Computational Research, Lawrence Berkeley National Laboratory. Coordinating Principal for the SciDAC Visualization and Analytics Center for Enabling Technology (VACET). Laureate Professor of Mathematics, University of Newcastle, Australia. Fellow of the American Mathematical Society. Fellow of the Royal Society of Canada. Fellow of the Australian Academy of Science. Foreign member of the Bulgarian Academy of Sciences. Past President of the Canadian Mathematical Society. Samsung Professor, School of Engineering, Stanford University. Member of the National Academy of Engineering. Fellow of the IEEE, SIAM, and INFORMS. Distinguished Lecturer of the IEEE Control Systems Society. IEEE Control Systems Award, 2013. Erdös #2, Einstein #4 (AMS). Professor of Mathematics, Clemson University. Co-founder, Electronic Journal of Combinatorics (one of the oldest electronic journals). Neil's work was featured in Numberphile & Numberphile2! Managing Director, Global Head of Market Modelling, Morgan Stanley. Executive Director of the Math Finance program at NYU's Courant Institute. Trustee for the Museum of Mathematics in New York. Quant of the Year by Risk Magazine in 2003. ISA Medal for Science in 2008. Financial Engineer of the Year 2010, International Association of Financial Engineers (IAFE) and Sungard. Over 70 publications in academic and industry-oriented journals. Associate editor for 8 journals related to mathematical finance. Chair of the Economics Department, Cornell University. Professor, Computer Science, Cornell University. Chair of the NASDAQ-OMX Economic Advisory Board. "Networks, Crowds and Markets", with Jon Kleinberg. Editor of the Journal of Portfolio Management. Professor of Finance at EDHEC Business School. Member, board of directors BlackRock's complex of closed-end funds. Kalotay-Williams-Fabozzi model of short rates. The Handbook of Fixed Income Securities. Professor of Mathematics, University of California, Irvine. "Handbook of Set Theory", with Akihiro Kanamori. Five publications in Annals of Mathematics. President and Principal Consultant, Goddard Consulting. Visiting Lecturer, Beedie School of Business, Simon Fraser University. Ph.D. in Engineering from the University of Cambridge. Faculty, Department of Mathematics, University of California, Berkeley. Chair, Operations and Information Technology, University of California, Berkeley. Professor of Finance, Columbia University. Roger F. Murray Prize, Q Group. Best Paper Award, Review of Financial Studies. Chair, Department of Computer and Information Science, University of Pennsylvania. Quantitative Portfolio Manager, SAC Capital. Former Co-Head of Systematic Trading, Bank of America. Long-time collaborator of Les Valiant, FRS. Best Paper Award, Journal of Trading, 2010. "The Computational Complexity of Machine Learning". Founder, Center for Innovative Financial Technology, Lawrence Berkeley National Laboratory. Research Fellow, Department of Finance, University of California, Berkeley. Co-founder, IAC (acquired by Investment Technology Group). Professor, Political Economy, University of Cambridge. Fellow of the British Academy. Fellow of the Institute of Mathematical Statistics. Fellow of the International Statistical Institute. Fellow of Trinity College, Cambridge. Mathematics Prize, London School of Economics. Professor of Finance, VU University Amsterdam. Best Paper Award, American Finance Association. Royal Dutch Economic Association Award. "Introduction to High Frequency Finance", with R. Gencay, M. Dacorogna, U. Muller and O. Pictet. Professor of Finance, Johnson Graduate School of Management, Cornell University. Chairman of the Board of Directors, Investment Technology Group. Member, CFTC-SEC Emerging Regulatory Issues Task Force. Member, Advisory Board, Office of Financial Research, U.S. Department of Treasury. Fellow of the American Finance Association. Former President, American Finance Association. Former President, Western Finance Association. Former President, Society for Financial Studies. Former President, International Atlantic Economic Society. Former President, Financial Management Association. Executive Director, Global Asset Allocation, UBS. Professor of Mathematical Finance, Complutense University. Vice-Dean of Quality Assurance, Business School, Complutense University. Head of Rates and FX Analytics at Pacific Investment Management Company (PIMCO). Visiting Lecturer of Mathematical Finance at University of Oxford. Adjunct professor at Imperial College, London. Board of directors of the International Swaps and Derivatives Association (ISDA). Board of trustees for the Global Association of Risk Professionals (GARP). Former Head of the Complex Derivatives Trading Desk and Research Group at Barclays Capital. Volatility and Correlation: The Perfect Hedger and the Fox. Plight of the Fortune Tellers: Why We Need to Manage Financial Risk Differently. Coherent Stress Testing: A Bayesian Approach to the Analysis of Financial Stress. Volatility and Correlation in the Pricing of Equity, FX and Interest-Rate Options. Deputy Director, Lawrence Berkeley National Laboratory. Former Director, National Energy Research Scientific Computing Center (NERSC). Founding Director, Berkeley Lab's Computational Research Division. Algorithms for large-scale eigenvalue problems. Domain decomposition algorithms for unstructured domains in parallel processing. Twice Winner of the Gordon Bell Prize, ACM (1998, 2009). Member of the NASA team that developed the NAS Parallel Benchmarks. Co-editor of the biannual TOP500 world rank of Supercomputers. Head of Equity Execution Strategies, Goldman Sachs. Former Head of Research at NYSE. Former Researcher, Federal Reserve Bank of New York. Managing Director, Quantitative Research, Bank of America Merrill Lynch. Founder and CEO, LSP Partners. Co-inventor of the Dow Jones LSP Indices. R&D 100 Award, R&D Magazine. Professor of Mathematics, Western Michigan University. "Techniques of Variational Analysis", with J.M. Borwein. Professor, Department of Finance, London School of Economics.